AIB Denmark released their final report regarding a serious bird strike incident involving a Boeing 737-400 at Copenhagen in July 2013. A SAS Boeing 737-400 operated on scheduled flight, SK-1462, from Copenhagen, Denmark to Oslo/Gardermoen in Norway. Following initial take-off from runway 04R at Copenhagen, the flight crew noticed a flock of birds in front of the aircraft. Immediately thereafter – at approximately 800 feet AGL – a “bang” was heard in the aircraft and the flight crew noticed a smell of burned material from the air conditioning system. 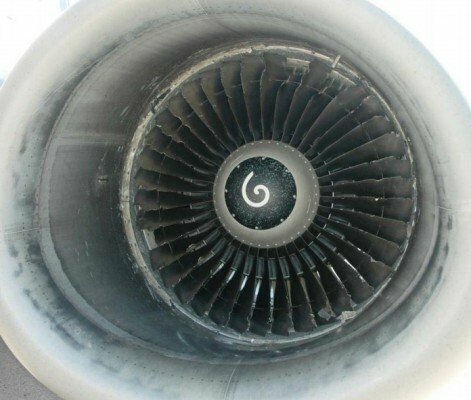 One or more birds hit the left engine which resulted in abnormal engine vibrations. The flight crew advised the aerodrome control tower of the bird strike and requested a return for landing. The aircraft landed safely on runway 04R. The airport fire and rescue services followed the aircraft and observed fluid leaking from the bottom of the left engine. Therefore, the Tower controller instructed the flight crew to taxi to a deicing platform were the the crew and passengers disembarked the aircraft. AIB Denmark noted that the number of bird strikes at Copenhagen had decreased from 141 in 2012 to 105 in 2013 and did not issue any safety recommendations. The serious incident was caused by a birdstrike to the left engine. One or more Common Shelducks damaged the left air intake duct and the engine fan which resulted in abnormal vibrations and a fuel leak from the left engine. As a result of the altitude AGL of the birds, it was not possible for EKCH’s Wildlife Control Unit to observe and act against the flock of migrating Common Shelducks.